Second Harvest is extremely grateful to be chosen as the Official Charity for the 2019 Bloomsday! Thank you in advance for helping someone in need in your neighborhood put nutritious food on their table. Your donation will deliver more healthy food to the people who need it most—working families who can’t quite make ends meet, seniors on fixed incomes, and children with parents in poverty, prison, addiction or with disabilities. Every dollar you donate through your Bloomsday registration provides food for five meals. Run your race this year knowing you helped lift someone up! Bloomsday and Second Harvest have some key commonalities in our missions. While Bloomsday promotes physical fitness for health, Second Harvest works to move people towards healthy living through nutrition education, fresh produce and whole foods. Both organizations value and strive to maintain a strong sense of community. 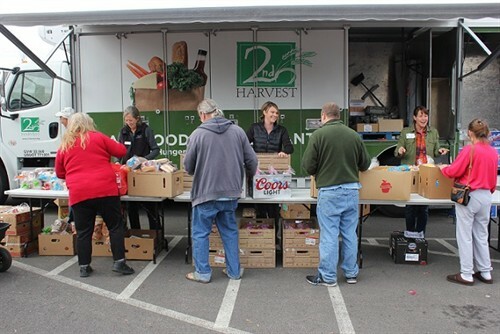 Second Harvest has been a regional leader in hunger relief for 48 years in Spokane and throughout the Inland Northwest. Much has changed over the years, but one thing remains the same: food is a basic need and if not met, people can’t function to their full potential. They can’t work to get that next better job, children can’t focus in school, and people with poor nutrition are susceptible to a host of health issues—like this elderly gentleman who lives in a low-income apartment in a rural Eastern Washington town. A little about how we get food to the people who need it most. The millions of pounds of food donated to Second Harvest throughout the year allows us to provide the equivalent of 69,000 meals every single day. Through a network of 250 partner food banks, food pantries, and meal sites, we feed up to 55,000 people every week in 21 Eastern Washington and five North Idaho counties—people like Lacey, a mother of two young children who often skips meals to make her budget work. “Half the time I don’t eat at work because I want to be sure the kids eat,” says Lacey, who works as a caregiver for people with disabilities. On this particular day, Lacey received food from one of Second Harvest’s Mobile Markets in Spokane. Since 2006, this program has provided primarily fresh produce and other perishable foods through a farmer’s market style food distribution. 8,000 to 10,000 pounds of food are loaded on a truck and delivered to community centers, church parking lots, and businesses in areas of high need including food deserts in outlying rural communities. More than 200 Mobile Markets hit the road each year feeding between 250 and 300 families at every distribution. 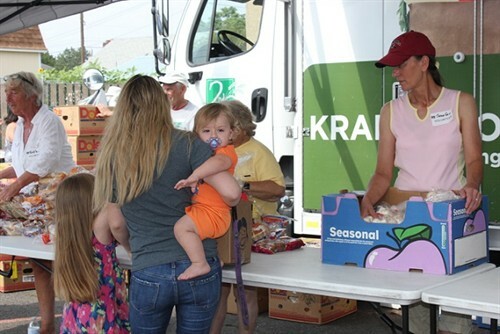 The Mobile Market program is just one of several innovative Second Harvest programs aimed at feeding people today while helping them become more self-sufficient tomorrow. Through the Kitchen at Second Harvest, we offer nutrition and cooking classes for children and adults. 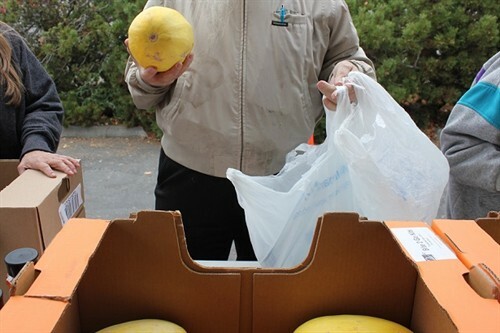 Our Bite2Go program provides meals and snacks to food- insecure school children for the weekends, and our senior box program brings much needed nutrition to low-income seniors. Second Harvest is only able to provide food at no cost to people in need because people like you care and contribute. From dedicated volunteers—more than 8,000 of you a year between our Spokane and Pasco distribution centers—to generous food and financial donors, there’s an incredible amount of community support that feeds and fuels hungry families, children and seniors. Every dollar you donate will provide food for five meals to people facing hunger today. Thank you for adding a donation to Second Harvest to your Bloomsday registration. Bloomsday's support of the Guilds' School this year is part of an overall commitment to non-profit organizations and programs that benefit the community. Over the years, organizations given Official Bloomsday Charity designation (and funding from donations from Bloomsday participants) have included Friends of the Centennial Trail, Team Parkinson & Parkinson's Regional Center of Spokane, Eastern Washington Affiliate of the Susan G. Komen Breast Cancer Foundation, Vanessa Behan Crisis Nursery, Cancer Patient Care, YMCA/YWCA Capital Campaign, SNAP, Hospice of Spokane, Boys & Girls Clubs of Spokane County, the Martin Luther King, Jr. Family Outreach Center, the Salvation Army of Spokane, World Relief Spokane, and the Guilds' School & Neuromuscular Center. The Lilac Bloomsday Association is itself a 501(c)(3) non-profit with a mission "To promote national and international sports competition and fitness education for the civic betterment, social improvement, and physical well-being of the general public." Among the programs Bloomsday supports as part of this mission is the 10-week Fit For Bloomsday run-jog-walk program that is implemented each year in about 70 elementary schools, with over 7,000 kids participating. Bloomsday also sponsors the All City Elementary Cross Country Meet each fall, where nearly 1,000 children compete. And Bloomsday also sponsors travel each year for 30 of the region's top cross country runners to compete in the Foot Locker West Regional Cross Country Championships in southern California. In addition, Bloomsday supports a dozen non-profits every year by giving them donated booth space in the Trade Show (and paying for setup of those booths). So whether producing an event that encourages health and wellness, supporting youth fitness activities, or giving a boost to other non-profit organizations, Bloomsday remains committed to playing an active role in the life of the Greater Spokane community.